Durham School Services employees, like Kacey Waddell, left, and Christy Lamberson, spend hours at busy intersections in search of the next batch of school bus drivers. Their orange safety vests and yellow school buses glow in the summer sun. They're hard to miss, but their services can be overlooked. Bus drivers, monitors and other employees of Durham School Services have spent many mornings this summer near busy intersections, standing near parked school buses and waving to people driving by. They do this every summer, encouraging more people to apply to be drivers. For school districts around the country, finding new bus drivers and keeping them between school years is a growing challenge. The size of the challenge in Spokane grew considerably this summer. A series of new routes and the closure of an elementary school for remodeling means the fleet is looking to increase in size by about a quarter. Spokane Public Schools outsources the responsibility of recruiting and coordinating buses to Durham School Services, a school bus branch of a transportation firm that serves more than 500 school districts in 38 states and four Canadian provinces. In addition to needing more drivers to cover Franklin Elementary School's students, Durham is looking to add more routes, spreading the workload across more drivers. Brenda Wood, one of Durham's bus driver field recruiters, says Spokane had about 150 drivers this year, which is an average amount. Wood, who was also a driver this year, says about 20 or 25 leave every summer, a gap they can usually fill, but this summer they're looking to hire about 40. She also expects to lose a few more drivers than usual after the especially harsh winter. To reach that goal, Durham is advertising on TV, hosting booths at street fairs and sending recruiters with big cardboard signs to stand on street corners, to draw in potential applicants. Many school bus drivers, Wood says, are veterans, retirees, stay-at-home parents and college students looking to make some extra money, or working between other jobs. "The pay isn't bad, and it is steady and consistent throughout the school year," Wood says. "[But being a] school bus driver is not meant to be the No. 1, bring-home-the-bacon kind of thing." Christy Lamberson is standing on the corner of Division Street and North Foothills Drive. The intersection is bustling, with herds of cars passing through at every change of the light. Though she's not facing the sun, she still has to squint as she smiles and waves at drivers. Lamberson is a relatively new recruit. A driver for about seven months, she's already helping bring in the next group. She began this year as a substitute bus driver, covering morning shifts. As the mother of a son with autism and attention deficit disorder, she was looking to make some extra money. Reflecting on her experiences with her own son, Lamberson says she felt especially sympathetic to the needs of special education students. Being a bus driver means more than picking up and dropping off students. Lamberson says that Durham's team dynamic and the connections with students really made it special for her. "It's a fun and fulfilling job. You definitely don't have the same thing happening every day," she says. "New routes, new kiddos, new faces. And you get to meet everybody for the first time. It's like meeting a new friend." Lamberson says she greets every students with smiles, high-fives and fist bumps to get them in a good mood for the day ahead. Some buses also have monitors, people who ride along to make sure kids are safe and obeying the rules. Wilma Ives has been a monitor for buses transporting kids with special needs for a little more than a year. She found a shady spot on the other side of the street, where she waved a yellow Frisbee with Durham's contact information on it. The other monitors and drivers call her "Grandma" or "Mom." It's a fitting name. She has been a foster grandmother, and outside of work, she says, she likes to bake and buy gifts for her family in preparation for holidays. She says her son has worked with Durham for more than 25 years. "He's been after me a long time. I didn't think I could do it," Ives says. "So when I turned 75, I decided I could, and I wish I would have done it sooner." Ives prides herself on her efforts to help kids on her buses develop and grow more comfortable, even though she doesn't have to. The monitors are affected by the need for drivers because they often work in teams, meaning a substitute driver who's not as familiar with the routes becomes another responsibility for the monitor. Ives faced this challenge last year, when her usual driver fell and hurt his shoulder one morning. Unexpected bumps in the road like this are the most challenging part of the job, she says. Hiring school bus drivers is complicated. The job demands a Commercial Driver License, training and a clean background. However, after earning the required license endorsements, completing 20 hours of classes and 20 hours of on-the-road training, and passing background checks, applicants end up with a job with limited hours and less competitive wages. 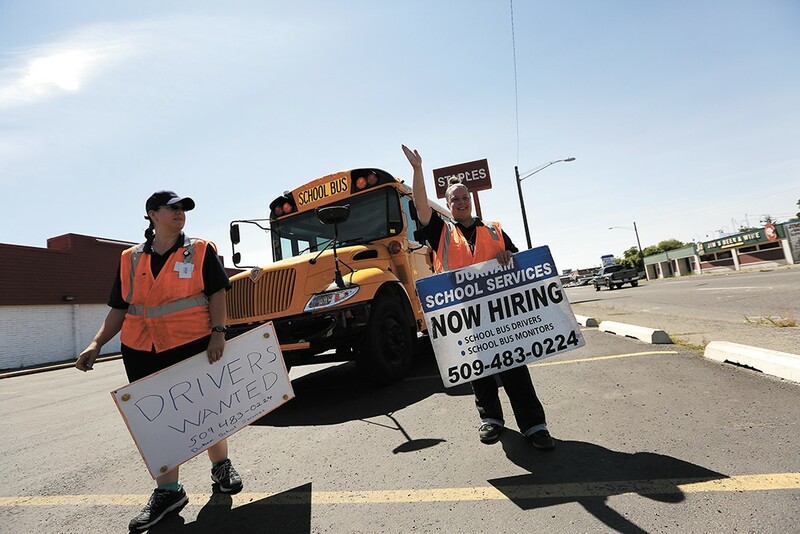 School bus and special client — generally the elderly and people with disabilities — bus drivers averaged $14.99 an hour in Spokane, Pend Oreille and Stevens counties in 2016, according to the Washington State Employment Security Department. That's about $5 less than the average median wages for the three counties in 2015. Additionally, jobs with similar licensing requirements, like transit bus and tractor-trailer drivers, averaged wages within $0.75 of the counties' medians. Those jobs also offer more hours throughout the year. Franklin Elementary on the South Hill will be closed for remodeling next year. This means a number of kids who would normally walk to school will have to take the bus to a school farther away, stretching transportation resources along with the addition of new routes. It's unlikely that Durham will hire 40 drivers over the summer, Wood says, but she emphasizes the fact that they hire year-round and should meet the goal in the next five or six months. "It is never a quick process," says Kate Walden, Durham School Services communications director. The amount of available recruits is also subject to factors entirely out of Durham's control, she says. "Industry-wide, there have been ebbs and flows; right now it is a challenging time across North America," Walden says. She notes that adapting to peaks and troughs is a regular part of Durham's routine, so the challenge is manageable. In a surging economy, people are more likely to find full-time jobs, but in a slow economy, full-time jobs are more appealing. "If you have children or are a retiree or veteran, it is a great job," Walden says. "It depends on where they are and their situation." Ives looks back fondly on her work as a monitor. One instance in particular stands out to her: One of the students was unable to unbuckle himself to get off the bus and panicked, slapping at Ives' hands when she tried to help. She managed to calm him down and asked for his help releasing the belt. He put his hand on top of hers while she pushed the release button. The next day, she put her hand on his while he pushed it.